How Much Do Custom Aluminum Enclosures Cost? Safe-T-Cover offers a patented slab mounted heater designed and UL-2021 rated for wet/damp environments. To see how this thermostatically controlled slab mounted heater is superior to wall mounted heaters, take a look at this short video. 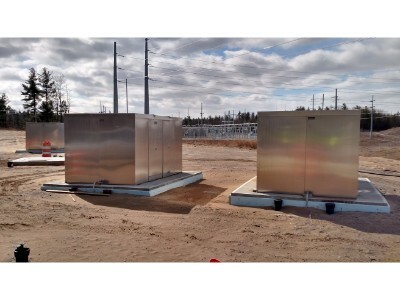 Our enclosures, when the correct wattage of heating is installed, will maintain 40 degrees Fahrenheit inside the enclosure when the exterior temperature is as low as -30 degrees Fahrenheit as is required by ASSE 1060 Class 1. So even in the coldest environments, if you need to keep the equipment inside the enclosure from freezing, you’ll be able to do so with this heating option. The slab mounted heaters cost about $500-1000 and must be purchased with the enclosure and are not sold separately. We also offer a couple of alternate heating solutions. You can find the full list of our hot box heaters here. Often the equipment installed inside the industrial enclosure generates heat. In that case, an exhaust fan and louver system can be installed. The exhaust fan is wired through a thermostat and when the temperature reaches the set point the fan will run and the louver will open to draw air through the enclosure. Plan on a range of $1,500 to $2,000 to add ventilation to the enclosure. The biggest factor impacting the cost of the enclosure is the size. 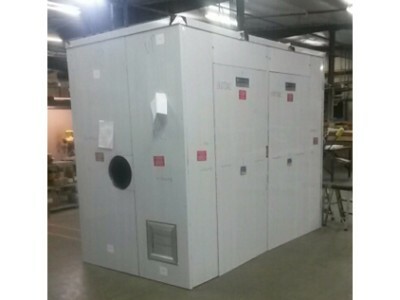 Our panel design allows us to build large enclosures, including some as large as 20’ wide x 40’ long x 15’ tall. So if a standard size enclosure doesn’t meet your need, we can build it to an exact dimension. Likewise, a short discussion with one of our custom enclosure specialists could help to optimize the size and potentially reduce the cost for you. The cost can range from about $2,000 for a small enclosure to as much as $25,000 for a very large enclosure. 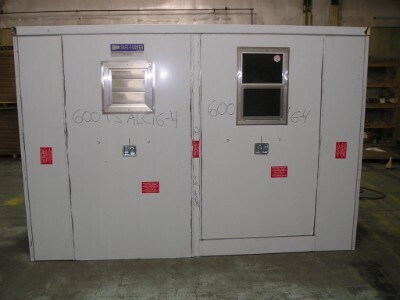 You can also look through our standard industrial enclosures pricing list to get an idea of size vs cost. An enclosure can be manufactured in many different colors to meet a specific need of the installation. Our most popular choice is the Hartford Green color. You can see a full selection of our color options here. Color typically adds 15-20% to the cost of the enclosure. A lot of people ask how the enclosure is colored. They are not painted and there is no risk of chipping over the life of the enclosure. We work with Pac-Clad®, the largest manufacturer of metal roofs in the United States. They apply a prefinished sheet metal coating of 70% full polyvinylidene flouride to the aluminum. It was originally developed for use in abrasive environments but is also ideally suited for enclosures. Sometimes we’ll build an industrial enclosure for a pump system or an air compressor and the customer needs a window for a quick visual inspection of the control panel. In some larger enclosures, the windows are also used to allow some natural lighting as routine maintenance is being provided. Depending on the size, windows typically range from $350 to $750. Our enclosures come standard with removable access panels. We can work with you to specify the exact locations for ease of access and maintenance. 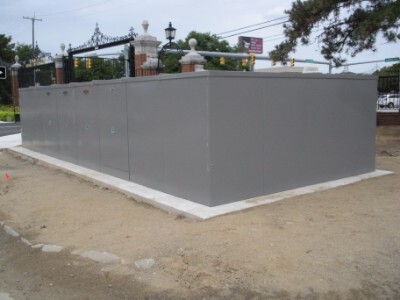 The access panels are most often installed along the length of the enclosure but in many cases the access panels can be installed along the width. If a hinged door is needed in addition to or in place of the removable access panels, these can be provided as well. 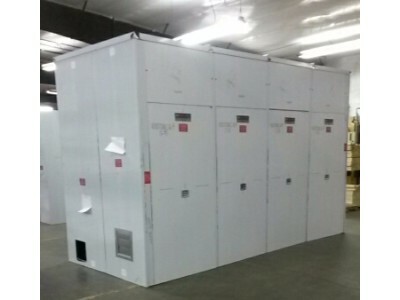 Access panels are included in the price and hinged doors add another $350 each to the cost. We are often asked if we sell equipment to monitor the temperature inside the enclosure or if the power has failed. Yes, we can provide this equipment if you need to be alerted in these instances. The list price for the Temperature And Power Failure (TAPF) system is $1700. Here is more information about our available accessories. 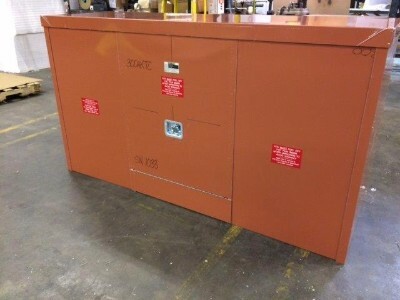 if the enclosure needs to be mounted to a skid, we can work with your engineer to design a mounting system that will work for your specific application. The additional hardware is included in the enclosure price.